In the rigorous Russian winters the stove was a haven of warmth, a symbol of home. It was so venerated that people did their best to make the stove decorative, too, and the custom of facing it with ornamental tiles developed. These tiles had designs of all kinds on them, including geometrical patterns, figures and humorous or instructive scenes with amusing captions. At first Russian stoves had ordinary tiles with rather simple designs in relief - circles, rosettes or wavy lines - and the tilemaker was clearly influenced by the wood-carver. Gradually, the tiles assumed more complicated shapes and the decorations became more fanciful, showing plants, animals, birds, human beings and, finally, scenes from life. Some paintings formed a series telling a story in pictures. 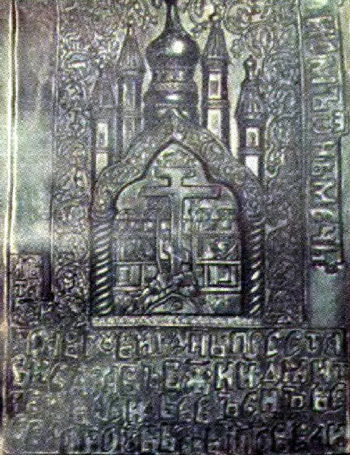 The first Russian tiles apparently date back to the tenth century. The earliest traces of them were found in Kiev on the site of Desyatinnaya Church - one of the first Kiev churches to be built of stone. The altar of St. Sofia's Cathedral in Kiev was ornamented with mosaics and coloured tiles, and in princes' mansions coloured tiles were used as flooring. But the Tartar invasion of the thirteenth century halted the progress of ceramics for a long period, and tiles disappeared even from towns untouched by the nomad hordes. 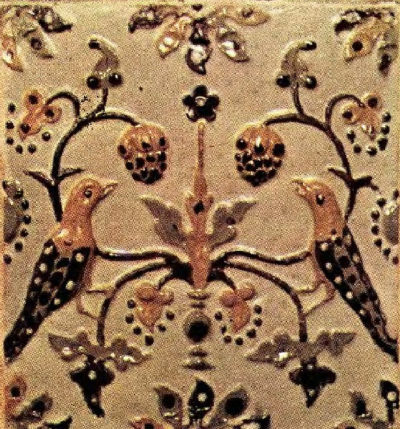 Only in the sixteenth and seventeenth centuries did tiles come back into use as a means of decorating buildings. In Moscow they became even more popular than in Kiev, and were used on exteriors. During Peter the Great's reign (early eighteenth century) there were significant changes. Relief glazed tiles gave way to tiles with pictures on them. The fashion was for stove tiles covered with an opaque white enamel and then painted in blue. These appeared after the victorious Northern War, when Peter the Great captured many Swedes and sent them to Moscow. Among these prisoners there were many good potters, who taught their techniques to Moscow potters. Blue-and-white, the tiles became popular throughout Russia. Stoves faced with such tiles can be found in Suzdal and many northern areas, such as Archangel. Near Moscow is an old estate called Abramtsevo. Its history is closely associated with the Aksakovs, a family of writers. The artist Mikhail Vrubel frequently went to Abramtsevo to make pottery. 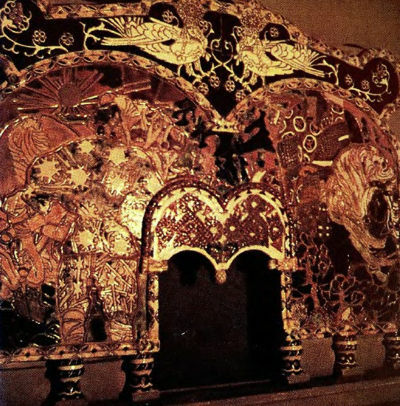 In the wooden towerroom which he made his studio, works of Russian folk art are exhibited along with Vrubel's ceramics portraying Pushkin's beautiful Swan Princess and Czar Gvidon and the dashing Mizghir from Ostrovsky's "Snow Maiden". Visitors admire Vrubel's ornamented tiles facing the fire-place. 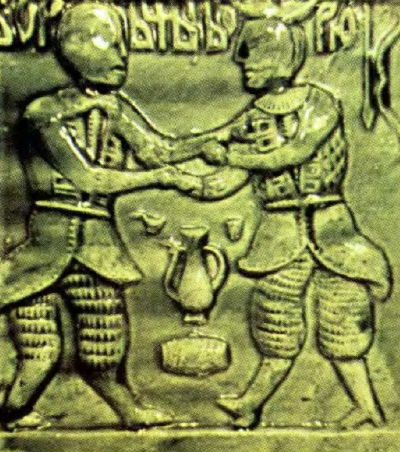 The artist had a unique understanding of the style and spirit of the old artists of Russia, yet his ceramics lack the serenity and inner harmony of his predecessors. The artist was interested in the way the folk artists thought, rather than the decorative aspect of the tiles. In a letter dated 1891, Vrubel wrote: "Now I am back at Abramtsevo, and once again hear that intimate national note I so want to catch .... It is the music of a man who is at one with himself." This national note in Vrubel's tiles and pottery brings the art of past centuries close to our day. This multicoloured decoration was on the facade of a boyar's house. 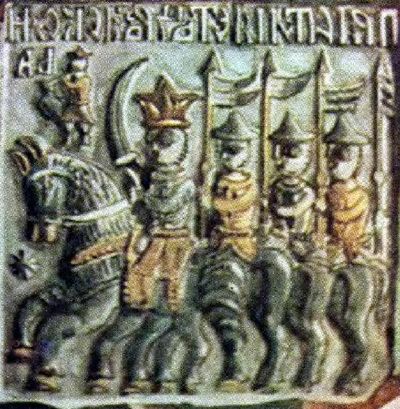 This military scene shows Russian cavalry going into the attack. Tiled stone decorated by Mikhail Vrubel, the artist, (1856-1910).